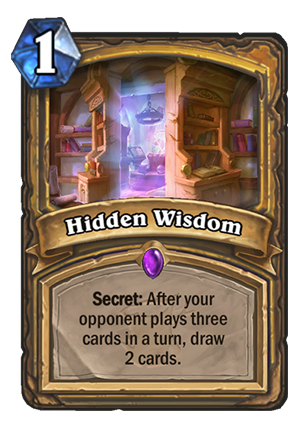 Hidden Wisdom is a 1 Mana Cost Epic Paladin Spell card from the The Witchwood set! Secret: After your opponent plays three cards in a turn, draw 2 cards. It’s a Rat Trap, but for Paladin! And honestly, just like with the Rat Trap, I don’t really see it working too consistently. The thing is, look at how often your opponent plays 3 cards in a single turn before the late game. With Coin, maybe, but still not always (they often e.g. use Coin on T3 to play a 4 mana card, so 2 in total). Unlike Rat Trap, however, which is a huge tempo gain once it procs, this one isn’t. You get +1 card advantage, which is like playing a 1 mana Arcane Intellect. Sounds great, that’s true, but you can’t control it and it’s delayed. Until your opponent plays those three cards in a single turn, which can be 5 or even more turns from whenever you’ve played it, you are a card behind. I mean, if you pull this from the Bellringer Sentry, then you technically get it for free from your deck, and thus gaining +2 card advantage might be juicy. 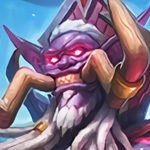 The problem is that you’d rather have some Secrets which gain immediate value, interact with the board, as the Bellringer Sentry himself is a low tempo play. It might see some play thanks to the Bellringer Sentry, but I don’t think it’s too powerful. 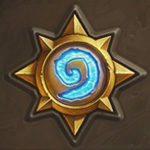 Heavily depending on the meta, it will get more value when either decks playing lots of 1-drops (especially stuff like Fire Fly) or combo deck pop out in the meta. If there was secret synergy in Paladin like there is in Mage, this could last long enough to be similar to Ice Block in that regard. Plus, when you do get to draw those two cards, it will likely be later on in the game when you’ll want them the most. It can be good, but I don’t expect it to see play unless Secret Paladin enters the metagame once again. for rat trap, yes, since most echo is cheap minion or spell, suddenly presenting them a big 6/6 body will put a huge pressure on those new cheap minions and could possibly messing up their tempo. but drawing 2 card? it really depends on luck whether those 2 drawn card will be able to reply on those echos action your opponent took. it’s just too slow of reaction. 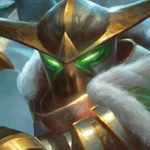 I just mean that Echo is the thing that would cause these secrets to proc. Drawing 2 cards for 1 mana is going to be good whenever it goes off (unless your hand is full). If the opponent is playing around it they are playing sub-optimal turns and restricting any echo effects to a maximum of 2 procs. So either this goes off and gives you your card draw or the opponent spends the whole game restricting their plays and, possibly floating mana to prevent it. 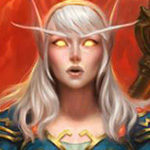 How to Counter Aggro (Or Tempo) against an Aggro (Or Tempo) Deck, as Aggro Paladin. 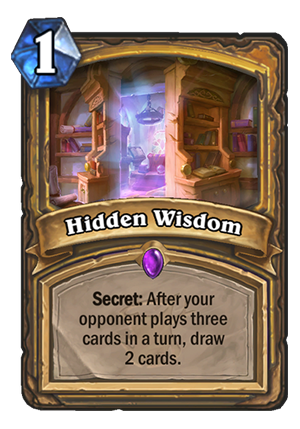 I’m having a very hard time picturing how these kinds of secrets are going to play out, but I’m looking forward to seeing if faster decks can afford to hold back cards in this way. My initial impression is that it’s not very good, though. So we got to see the new Paladin Secret. It’s not Avenge by any means. Like the Hunter Secret, it will heavily depend on the meta, or if you’re going first. Still, before or after your oponent will surely play 3 cards in a turn, and you’d like to draw 2 cards at any stage of the game. So it’s solid. 3.5/5 stars, good Paladin Secret.